The family situation mentioned before will not be good for a long time, but since that is sad and yarn is happy, we’re going to just focus on the yarn here now. Tonight I participated in a fast-and-furious swap in the Sanguine Gryphon group on Ravelry, it was so fun! The wonderful mods organized it as a consolation prize for those of us unable to make it to the crazy-awesome-open-house event going on at the SG studios in Maryland. Swapping in the SG group is always pretty great, there’s a lottery twice a week that I’ve won a couple of times and everyone is usually very helpful with destashes and in-search-of’s, but this was completely different. It occurred in ‘real time’ in one thread. An offer was made and the first person to reply and claim it got it and had to make a new offer. If an offer wasn’t claimed in 5 minutes, then a new one was made (which then usually got snapped up). I had a couple of skeins without a plan in my stash and was able to swap them for a couple of colorways that I really really love, which I’m psyched about. Even more fun, one of the skeins I claimed was one I had swapped a while back only because I had had no alternative at the time and I had missed it. So my little Bugga Common Emerald Moth took a vacation to Canada and will be on its way back here! I find it amusing that skeins of my yarn have met other SG groupies while I, myself, have not. Yet! There has been talk of a Massachusetts meet-up, which I really hope happens, because once January arrives I will actually have time for something of a social life. Looks like a lot of yarn all together like that, huh… oops. 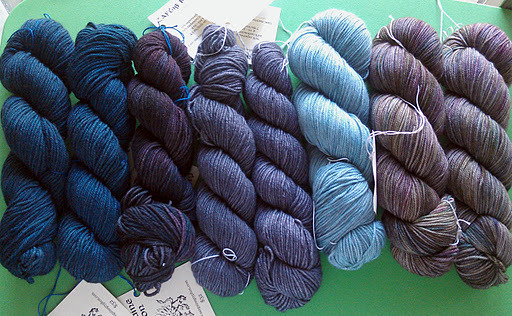 On the left there is 2 Zaftig in Box Jellyfish, Zaftig in Ruby-Tailed Wasp, 2 QED in Radius, Bugga in iSkein, and 2 Bugga in Fierce Snake, which is my own personal ‘sleeper hit’ of this season’s colorways. I did not think I would care for it since it involves so much pink and brown, but my Beribboned Wrists were made with the Zaftig version of the colorway and I just fell in love. Very complex and feminine and pretty. And believe it or not, I have plans for all of those skeins. To say I have an ambitious queue of things I want to knit is a gross understatement. In fact, can we talk about socks for a minute? I made a spreadsheet of all the socks I want to make because the Rav queue was just not good enough for me to keep track of it all. Can you believe that? Knitting dorkdom at its finest, am I right? I have (get ready for this) TEN DIFFERENT SOCK PROJECTS currently on the needles. I actually used to have more, but I frogged four that were just never going to get finished. So ten pairs on the needles and TWENTY-SEVEN MORE that I know I want to make in the near future. That’s a heck-of-a-lot-of-socks, and yes, I have the yarn for all of those patterns (and then some). When I do things like this I am reminded that I really don’t need more yarn right now, and I really do need to get knitting. I’m making a plan. Each month I’ll post my sock goals here and hopefully I’ll be able to reach them. 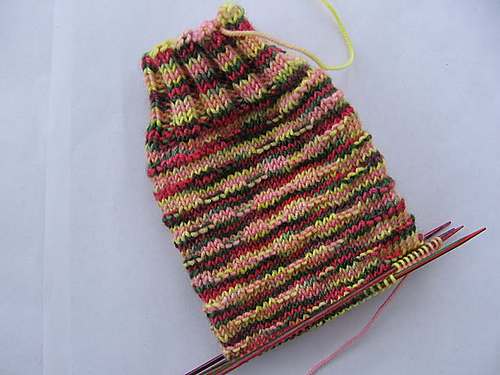 which are much further along than shown here, I have the first sock done and have started the second. That’s all I’ll probably be able to get done in the next 21 days, realistically, what with finishing my master’s and the holidays and all. Let’s not even talk about gift knitting right now. I am waaaaay far behind. Way. But anyway, socks– so happy, so good. They are, undoubtedly, my guiltiest guilty pleasure of knitting. What’s your favorite comfort project? Does the size of your stash or the length of your queue ever give you pangs of guilt, like it does me from time to time? Any particular knitting goals you’ve set for the future? 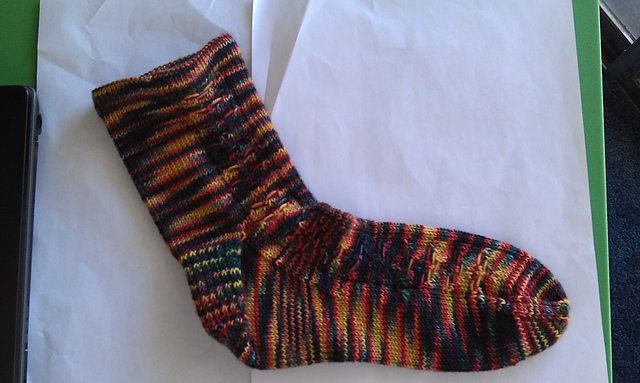 This entry was posted in Bugga, socks, STR, yarnaholic by shoelaceswitcher. Bookmark the permalink.